We launched an all-new version of KOBAS EPoS in July this year in just one food led venue. Since then, in less than 4 months, we’ve scaled out in both wet and foot led venues and sold over 300,000 items within over 125,000 orders on behalf of our customers. Since that initial release in the midst of this year’s glorious summer we’ve rapidly iterated on some incredibly useful feedback from our wonderful customers, and we’ve incrementally built an EPoS system that’s now turning heads everywhere. 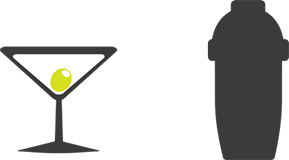 This weekend, hot on the heels of our KOBAS Cloud update this week, I’m pleased to announce that our latest version of KOBAS EPoS is now available. In this latest release we’ve added some really nifty features that I’d like to share with you here. 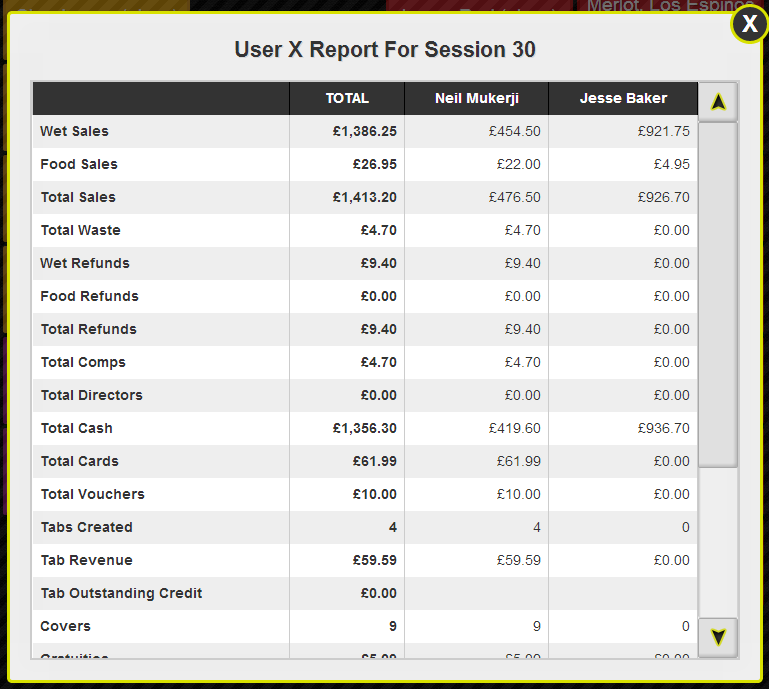 Born from a need to have roaming waiting staff working on an iPad independent from a cash drawer, we’ve added User X Reports so managers can monitor their team’s performance at any time. This is also incredibly useful for a little inter-team competition and incentivisation! Perfect for those big rounds, we’ve added a quantity item accelerator so you can quickly and easily add multiple identical items to a basket. It’ll copy any detailed configuration options such as mixer splashes too. Waiting staff can now leave a bunch of items in the basket and log off from any till or iPad, confident in the knowledge that the next time they log in on the same or any other till or iPad, those items will be remembered for them. This is perfect if there are multiple users per till or your staff are moving around a lot. We’ve added the ability to note the number of covers against a tab. This is particularly useful for food led venues but can also be used to monitor tab group size at wet lead venues. This number is printed on any work dockets and reported in the Till Z.
We’ve improved our tab bills and receipts in a number of ways. 1) If you’ve used the covers monitor mentioned above, we now print a handy split bill figure at the bottom of bills to save your customers from getting their calculators out. 2) We’ve now grouped identical items together to improve clarity and reduce paper usage. 3) Very large receipts (in excess of 100 line items) automatically have items printed slightly smaller to help save paper. We also split enormous (over 200 line items) bills onto multiple prints. This may sound crazy but we’ve seen bar tabs in excess of £2,500 that take quite some printing! 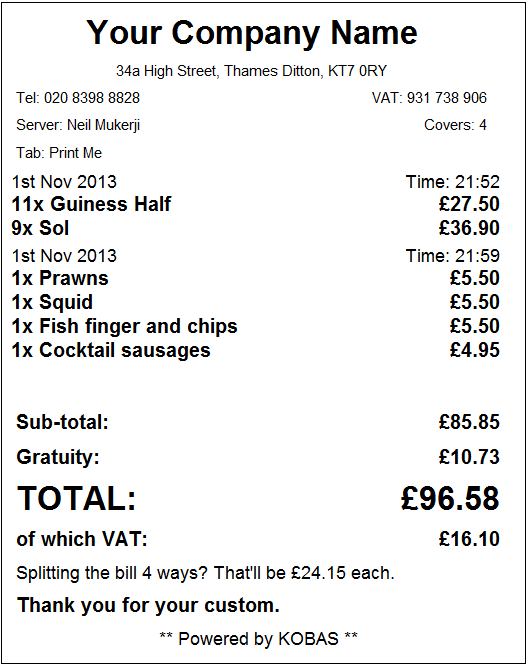 4) By default we show separate orders on tab receipts, as shown below. We find the extra clarity here really helps in the event of any quibbles. We realise this isn’t for everyone though, so we’ve now added the option to switch your venues to standard tabs where all the orders are merged. As ever there’s a load of background effort to ensure robustness and increase speed and ease of use. We’ve made it much faster to remove items from the basket. We’ve improved Java support for printers, and we’ve fixed a few glitches. If you’re interested in the details and what’s in the pipeline in the near future, please check out our Change Log. We hope those of you already using our EPoS are reaping the rewards. 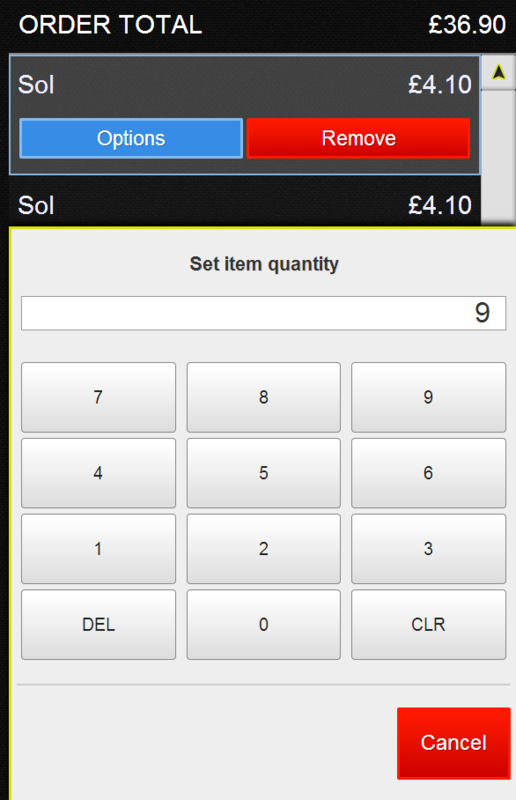 If you’re not yet using our EPoS and would like to know more, please get in touch.